Call us at (512) 388-3880 today. For more information or to schedule an appointment with our Round Rock chiropractor, call (512) 388-3880 today! Dr. Susan M. Correia D.C., ACN, CFMP is a chiropractor serving Round Rock and the surrounding area. Our chiropractor and the rest of the welcoming team at Round Rock Chiropractic are committed to providing chiropractic solutions to address your unique needs, whether you are experiencing back pain, neck pain, headaches, or even muscular tightness and tension. You may be searching for pain relief after an accident, experiencing an injury, or if you suffer from a specific condition like chronic back pain or a spinal condition. Even if you are looking to improve your overall health, our chiropractor can help you attain your everyday wellness goals! Visit our testimonials page to find out what our patients are saying about our Round Rock chiropractor and our chiropractic care plans. At your first visit to Round Rock Chiropractic, Dr Susan M. Correia D.C, ACN, CFMP will explain how chiropractic care works and give you a full evaluation to see if our chiropractic solutions are a good fit to address your needs. If there is a good fit, we can customize a plan of chiropractic care for your condition and health goals. If you have not been to a chiropractor before and want to find out more, please contact us or call (512) 388-3880 to receive the answers to your questions from our experienced team. We also welcome referrals, so we invite you to share our chiropractic and wellness information with your friends and loved ones. 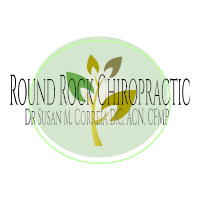 Dr Susan M. Correia D.C, ACN, CFMP has been the owner of Round Rock Chiropractic since 1997 and is a 1994 graduate of Parker College of Chiropractic in Dallas Texas. Dr. Correia D.C attends continuing education courses every year to keep up with the latest techniques to help her patients achieve optimal results. "I love coming here. Susan corriea has helped my back so much & her staff is so helpful when it comes to dealing with my insurance. I’ve also gotten to enjoy a nice massage here & highly recommend it! They run specials from time to time which will also help your wallet. Thank you, everyone!" "Great place Helped me with my allergies and shoulder I am really pleased with my results and the Doctor really listens to your concerns. I brought my kids here and same great service I recommend this place to people who want to live healthily." "Dr. Susan Correia and her staff are fantastic! I started going here in 2010 when I had a sporting accident that resulted in a strained neck injury. Dr. Correia was much gentler and more thorough than other chiropractors I had tried and I haven't looked back since! Also, Steven and Andria are amazing massage therapists - they are great at listening to my needs and fixing other issues they see that I haven't mentioned. I highly recommend going here!"